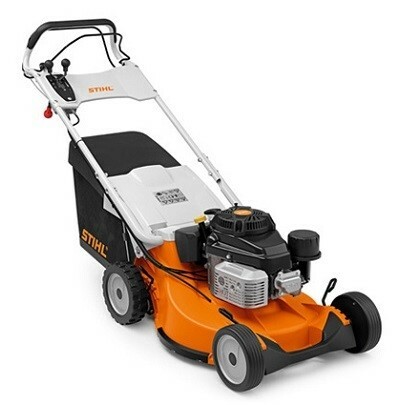 The STIHL RM 756 GS petrol lawn mower has been specially developed for tough, long-lasting use in a professional environment. With its 54cm/21" cutting width and its 3-speed gearing, this professional lawn mower is designed to mow areas up to 3000m². The hybrid housing is sturdy and durable. The foldable, dual-comfort handlebar can be adapted to your body height, ensuring the most comfortable working position, essential when you're mowing for long periods of the day. This model features anti-vibration elements which effectively reduce engine vibration, allowing you to comfortably use the mower for a full working day. With a 3 litre fuel tank for long running times coupled with the reliable and powerful Kawasaki engine, this mower is designed for large and tough mowing jobs. An 80 l grass catcher bag– made from tough fabric makes it easy to see when the grass catcher bag is full, whilst allowing excellent air flow to ensure the bag is filled to the brim. Each wheel can be adjusted independently to suit the lawn conditions, the alloy wheels also have premium, well sealed bearings for a long service life. 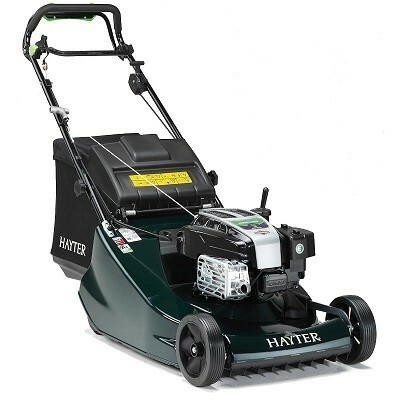 Hayter have long held that they are the makers of the finest lawnmowers - their offerings for 2019 are no exception to their long history of high quality machines. To make the Harrier series one of the most distinguished range of lawnmowers on the market today, Hayter have worked tirelessly to engineer machines that provide a beautiful and refined lawn with every cut. Proof of Hayter's design philosophy comes in the form of their lifetime crankshaft guarantee - their friction disc technology guards against your crankshaft bending if the blade ever collides with a solid object, but so great is their confidence in the friction disc, that you're guaranteed for life against engine crankshaft bending from accidental collision. This Harrier's variable speed lets you pick the working pace that best suits you - the innovative design of this models self-propulsion bail arm means that the further forward you push the bar, the faster your lawnmower moves (and vice-versa). The Blade Brake Clutch (BBC) also lets you keep the engine running while you empty the grass clippings, eliminating the need to get the engine restarted to go back to work. The ease-of-use features don't stop there, as the collection bag and handles have been designed so that you can lift the bag through them for easy emptying. 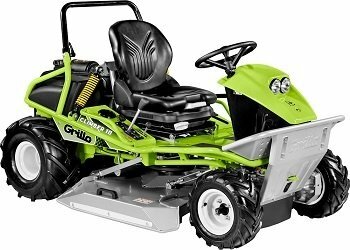 Grillo FD13.09 is a four wheel drive hydrostatic lawnmower with an out-front cutter deck, grass catcher for the collection and hydraulic high tip, it has a turning radius of only 31cm. It is a highly manoeuvrable and compact machine which is very stable on slopes and undulating ground! Even the most demanding commercial operator requiring a good quality of cut will appreciate the characteristics of its 132 cm cutter deck with collection in combination with the innovative charge accelerator and low noise level plus a grass catcher which has a total capacity of 900 L and a high-tip facility. 1. Front cutter deck together with the high driving position allows excellent operator visibility. Grass cutting is achieved via Triple contra-rotating blades with shock-resistant swing back tips. The hydraulically assisted floating deck gives constant pressure of the wheels on the soil for a clean cut especially on uneven grounds. Wheels of the cutter deck are all anti-puncture treated. 2.Cutting height adjustment is centralised and very easy thanks to a simple little hand wheel enabling the operator to choose with exactness infinite height positions. Grass is completely transferred to the grass catcher by means of the innovative turbine with floating blades which chops the grass into smaller pieces therefore increasing so the turbine’s efficiency as well as collected grass volume. Floating blades protect the rotor from accidental damages in case there may be debris such as stones etc. 4.The FD13.09 has a high hourly mowing in, for instance, large parks, sports facilities or camping sites or where the areas are very extensive, but also in more complex areas full of obstacles, such as plants or benches, thanks to the high manoeuvrability and the extremely small turning radius. 5.The innovative permanent 4 WD traction system with hydraulic differential lock allows the machine to work with maximum traction and without skidding, also without marking the grass even when the steering is at its maximum angle! The profile of the turf tyres and their width leaves a very small footprint, even when the grass catcher is full. 6.FD13.09 is a really compact machine! The hydraulic powered steering system allows a very tight turning radius of only 31 cm! The small wheelbase gives the machine extraordinary manoeuvrability in narrow spaces. 7. Cutting on steep slopes or transversally across inclined hillsides is helped by the excellent studied weight distribution as well as by the automatically or manually actively differential locking device in conditions of extreme steepness. The pivoting rear axle, allows the drive to all 4 wheels even when cutting on uneven ground. 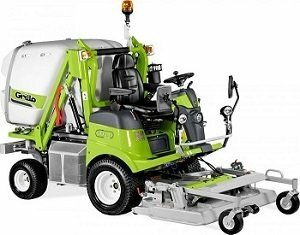 There are no problems with the FD13.09 in mounting kerbs or sidewalks etc..
Grillo FD900 is a four wheel drive hydrostatic lawnmower with an out-front cutter deck with a powered grass catcher for the collection and hydraulic high tipper. It has a fantastic turning radius for a well built Grounds machinery to get around trees, flower beds and tight spots. It is a highly manoeuvrable and compact machine which is very stable on slopes and undulating ground! 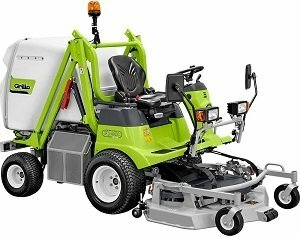 Even the most demanding commercial operator requiring a good quality of cut will appreciate the characteristics of its 133 cm cutter deck with collection in combination with the innovative charge accelerator and low noise level plus a grass catcher which has a total capacity of 750 L and a high-tip facility. 1. front cutter deck together with the high driving position allows excellent operator visibility. Grass cutting is achieved via twin contra-rotating blades with shock-resistant swing back tips. The hydraulically assisted floating deck gives constant pressure of the wheels on the soil for a clean cut especially on uneven grounds. Wheels of the cutter deck are all anti-puncture treated. 4.The FD900 has a high hourly mowing in, for instance, large parks, sports facilities or camping sites or where the areas are very extensive, but also in more complex areas full of obstacles, such as plants or benches, thanks to the high manoeuvrability and the extremely small turning radius. 5.The innovative permanent 4WD traction system with hydraulic differential lock allows the machine to work with maximum traction and without skidding, also without marking the grass even when the steering is at its maximum angle! The profile of the turf tyres and their width leaves a very small footprint, even when the grass catcher is full. 6.FD900 is a really compact machine! The hydraulic powered steering system allows a very tight turning radius of only 37 cm! The small wheelbase gives the machine extraordinary manoeuvrability in narrow spaces. 7. Cutting on steep slopes or transversally across inclined hillsides is helped by the excellent studied weight distribution as well as by the automatically or manually actively differential locking device in conditions of extreme steepness. The pivoting rear axle, allows the drive to all 4 wheels even when cutting on uneven ground. There are no problems with the FD900 in mounting kerbs or sidewalks etc..
8.FD900 is manufactured with a strong and robust chassis. The reinforced cutter deck is protected in areas exposed to wear and impact and the grass catcher support arms have over sized dimensions for strength and durability. During the machine’s construction a large percentage of high performance steel has been used. The hydraulic parts were sourced from the world’s top manufacturers. 9.FD900 is fitted with a Yanmar diesel engine, having 3 cylinders and rated at 31HP. The engine is liquid cooled with a self-cleaning radiator, the electric fan is able to reverse its rotation in order to remove grass and debris from the radiator. Engagement of this system is automatic and regulated by a sensor, but can also be activated manually. 10.FD900’s driving position is ergonomic and designed in such a way that the operator will not feel undue fatigue even after long periods of work. FD900 has a wide, comfortable and adjustable driving seat which is dampened and fitted with arm-rests. All hydraulic controls for the grass catcher and cutter deck are operated by means of practical electric push-buttons.